Directive 90/539/EEC lays down animal health conditions governing imports into the Community from third countries of poultry and hatching eggs. It provides that poultry and hatching eggs are to satisfy the conditions laid down therein and originate in a third country or part thereof included on a list drawn up in accordance with that Directive. 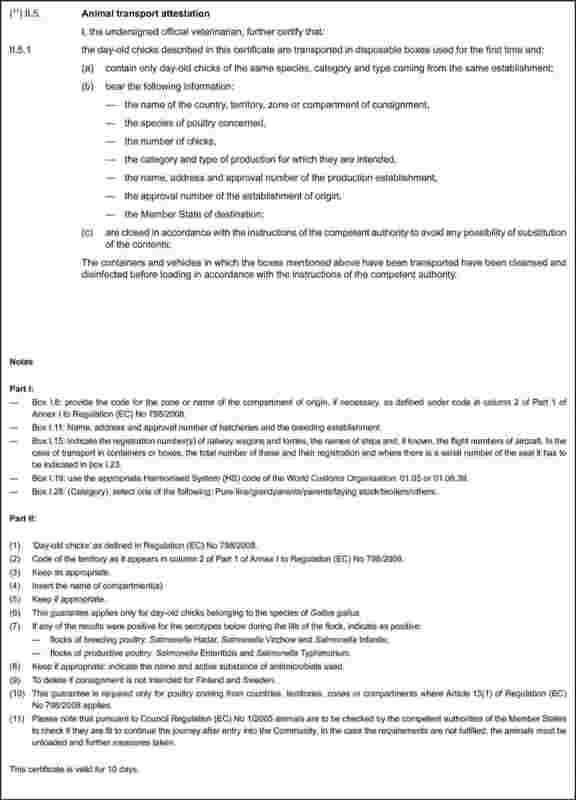 Directive 2002/99/EC lays down rules governing the introduction from third countries of products of animal origin and products obtained there from intended for human consumption. It provides that such products are only to be imported into the Community if they comply with the requirements applicable to all stages of the production, processing and distribution of those products in the Community or if they offer equivalent animal health guarantees. 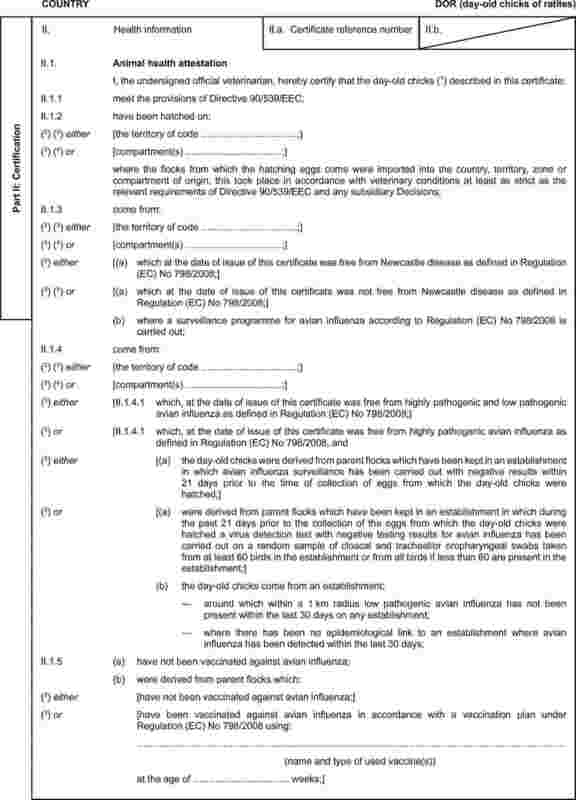 Commission Decision 2006/696/EC of 28 August 2006 laying down a list of third countries from which poultry, hatching eggs, day-old chicks, meat of poultry, ratites and wild game-birds, eggs and egg products and specified pathogen-free eggs may be imported into and transit through the Community and the applicable veterinary certification conditions (9) sets out a list of third countries from which the commodities concerned may be imported into, and transit through, the Community and lays down the veterinary certification conditions. 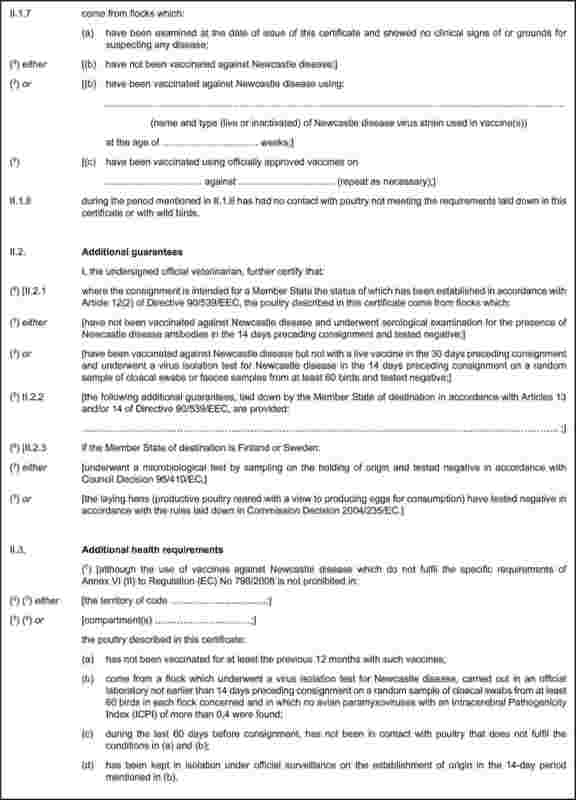 Commission Decision 93/342/EEC of 12 May 1993 laying down the criteria for classifying third countries with regard to avian influenza and Newcastle disease in relation to imports of live poultry and hatching eggs (10) and Commission Decision 94/438/EC of 7 June 1994 laying down the criteria for classifying third countries and parts thereof with regard to avian influenza and Newcastle disease in relation to imports of fresh poultrymeat (11) lay down criteria for classifying third countries with regard to avian influenza and Newcastle disease in relation to imports of live poultry, hatching eggs and poultrymeat. Community legislation for the control of avian influenza has recently been updated by Council Directive 2005/94/EC of 20 December 2005 on Community measures for the control of avian influenza (12), to take account of the most recent scientific knowledge and developments on the epidemiology of avian influenza in the Community and worldwide. The scope of the control measures to be applied in the event of an outbreak has been extended from highly pathogenic avian influenza (HPAI) to deal also with outbreaks of low pathogenic avian influenza (LPAI), and to introduce compulsory active surveillance for avian influenza and a wider use of vaccination against this disease. 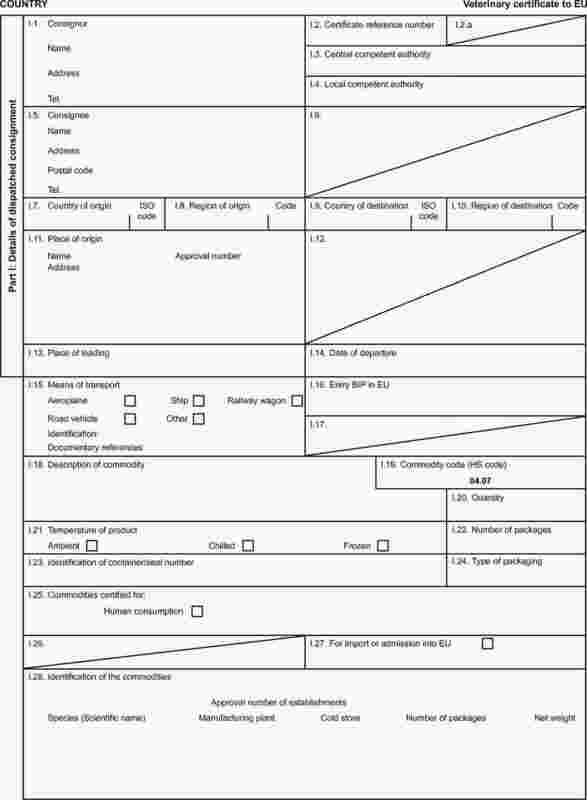 Imports from third countries should therefore meet conditions equivalent to those applied within the Community and which are in line with the revised requirements for international trade in poultry and poultry products laid down by the standards of the Terrestrial Animal Health Code of the World Organisation for Animal health (OIE) (13) and the Manual of Diagnostic Tests and Vaccines for Terrestrial Animals (14) of the OIE. Argentina and Israel have submitted their avian influenza surveillance programmes to the Commission for evaluation. The Commission has examined these programmes and they conform to the relevant Community provisions and therefore a positive evaluation of these programmes should be indicated in the column 7 of part 1 of Annex I to this Regulation. Article 21(2) of Directive 90/539/EEC sets out certain matters that are to be taken into account when deciding whether or not a third country or part thereof maybe included in the list of third countries from which poultry and hatching eggs may be imported into the Community, such as the state of health of poultry, the regularity and rapidity of the supply of information by a third country relating to the existence of certain contagious animal diseases, including avian influenza and Newcastle disease and the rules for animal disease prevention and control in the third country concerned. Article 8 of Directive 2002/99/EC provides that when drawing up lists of third countries or regions of third countries thereof from which imports of specified products of animal origin are permitted into the Community, particular account is to be taken of certain matters, such as the health status of livestock, the regularity, speed and accuracy with which the third country supplies information on the existence of certain infectious or contagious animal diseases in its territory, in particular avian influenza and Newcastle disease and the general health situation in the third country concerned which might pose a risk to public or animal health in the Community. 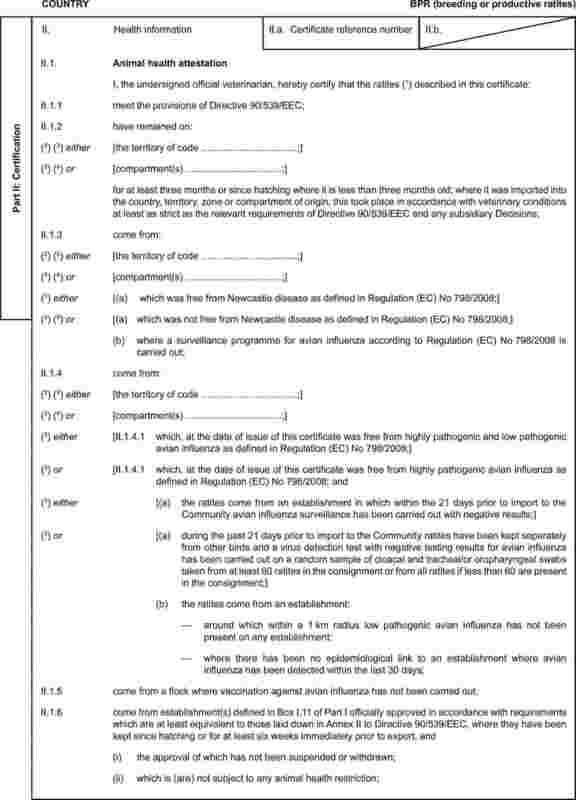 In the interests of animal health, this Regulation should provide that commodities should only be imported into the Community from third countries, territories, zones or compartments which have in place avian influenza surveillance programmes and avian influenza vaccination plans, where such vaccination is carried out. 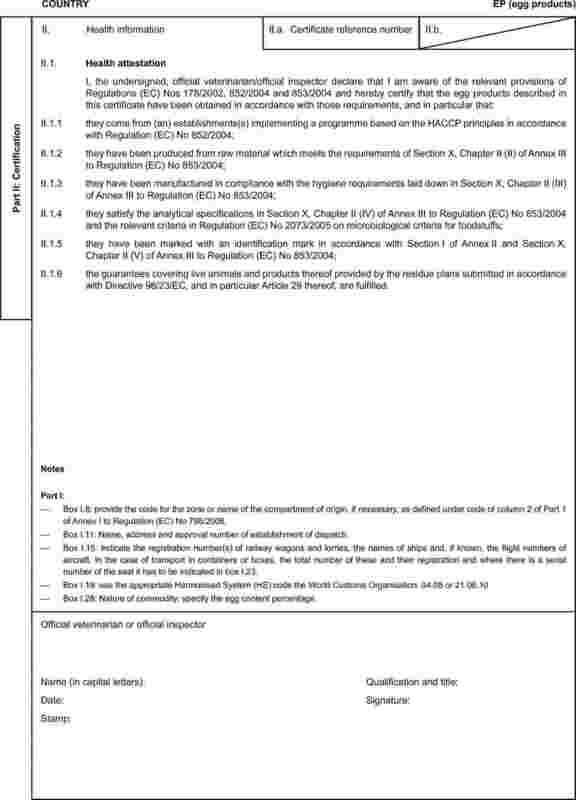 Pursuant to Regulation (EC) No 2160/2003, admission to or retention on the lists of third countries provided for in Community legislation from which Member States are authorised to import certain poultry commodities covered by that Regulation is subject to the submission to the Commission by the third country concerned of a programme equivalent to national control programmes for Salmonella to be established by the Member States, and its approval by the Commission. A positive evaluation of these programmes should be indicated in part 1 of Annex I to this Regulation. The Community and certain third countries wish to permit trade in poultry and poultry products coming from approved compartments and therefore the principle of compartmentalisation for imports of poultry and poultry products should be further laid down in Community legislation. The compartmentalisation principle has been laid down recently by the OIE in order to facilitate world wide trade in poultry and poultry products and therefore it should be incorporated into Community legislation. Currently Community legislation does not provide for certificates for the import into the Community of minced meat and mechanically separated meat of poultry, ratites and wild game-birds, for certain health reasons, in particular the traceability of meat used for its production. Accordingly, model veterinary certificates covering those commodities should be provided for in this Regulation following further scientific investigations. In order to provide more flexibility in certain situations for the competent authorities for veterinary certificates purposes, and based on several requests from third countries exporting day-old chicks of poultry and ratites to the Community, this Regulation should provide that such commodities should be examined at the time of dispatch of the consignment instead of at the time of issue of the veterinary certificate. In order to avoid any interruption in trade, imports into the Community of commodities that have been produced before the introduction of animal health restrictions, as set out in Part 1 of Annex I to this Regulation, should continue to be permitted for 90 days following the introduction of import restrictions for the commodity concerned. Specific conditions for transit via the Community of consignments to and from Russia should be provided for owing to the geographical situation of Kaliningrad which affects only Latvia, Lithuania and Poland. Council Regulation (EC) No 1234/2007 of 22 October 2007 establishing a common organisation of agricultural markets and on specific provisions for certain agricultural products (Single CMO Regulation) (15)set out general Community health rules applicable to the import into, and transit through, the Community of the commodities covered by the Regulation. 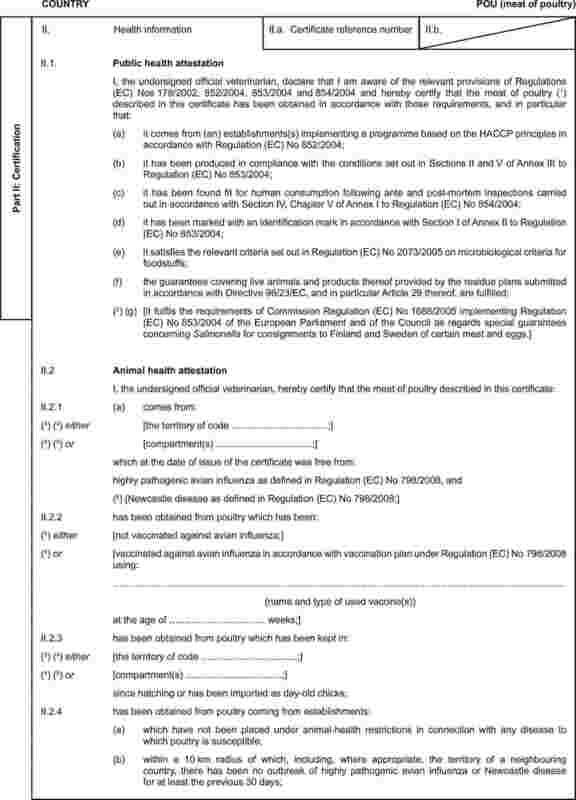 In addition, Council Directive 96/93/EC of 17 December 1996 on the certification of animals and animal products (16) lays down standards of certification which are necessary to ensure valid certification and to prevent fraud. 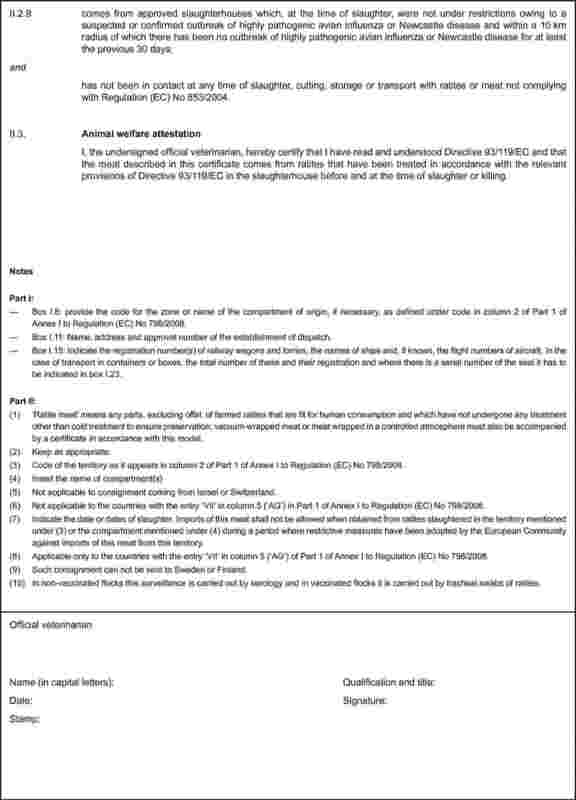 It is, therefore, appropriate to ensure in this Regulation that the rules and principles applied by third country certifying officers provide guarantees that are equivalent to those laid down in that Directive and that the model veterinary certificates laid down in this Regulation reflect only such facts as may be attested at the time the certificate is issued. In the interests of clarity and coherence of Community legislation, Decisions 93/342/EEC, 94/438/EC and 2006/696/EC should be repealed and replaced by this Regulation. It is appropriate to provide for a transitional period to permit Member States and industry to take the necessary measures to comply with the applicable veterinary certification requirements laid down in this Regulation. meat, minced meat and mechanically separated meat of poultry, including ratites and wild game-birds, eggs and egg products. It lays down a list of third countries, territories, zones or compartments from which the commodities may be imported into the Community. 2. This Regulation shall not apply to poultry for exhibitions, shows or contests. 3. This Regulation shall apply without prejudice to specific certification requirements provided for in Community agreements with third countries. ‘differentiating infected from vaccinated animal (DIVA) strategy’ means a vaccination strategy which enables a differentiation to be made between vaccinated/infected and vaccinated/non-infected animals through the application of a diagnostic test designed to detect antibodies against the field virus and the use of non-vaccinated sentinel birds. The commodities shall only be imported into and transit through the Community from the third countries, territories, zones or compartments listed in columns 1 and 3 of the table in Part 1 of Annex I. 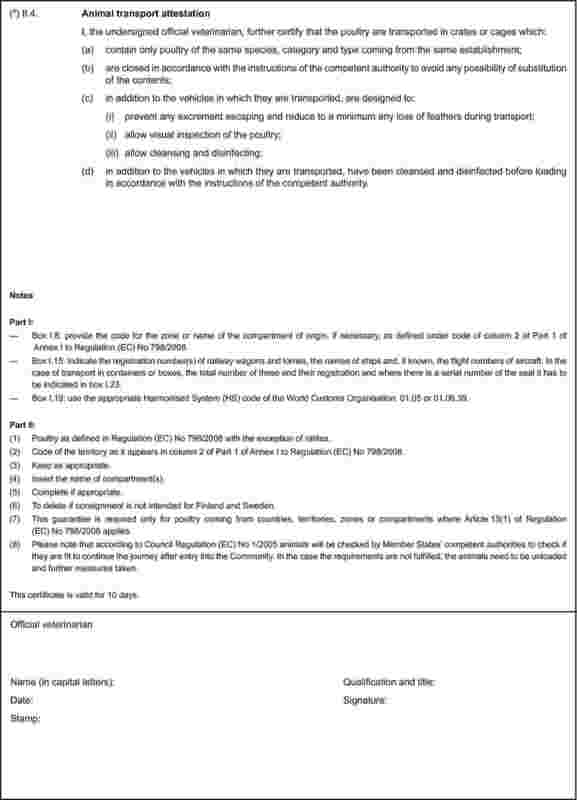 1. Commodities imported into the Community shall be accompanied by a veterinary certificate, as referred to in column 4 of the table in Part 1 of Annex I, for the commodity concerned, completed in accordance with the notes and the model veterinary certificates set out in Part 2 of that Annex (the certificate). 2. 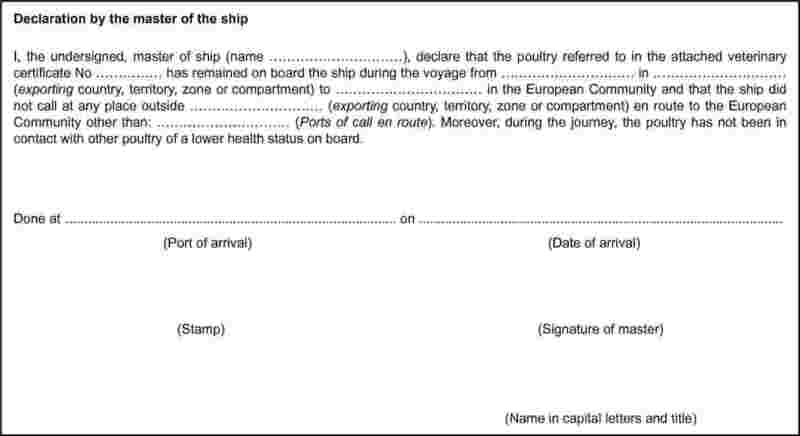 A declaration by the master of the ship, as set out in Annex II, shall be attached to veterinary certificates for imports of poultry and day-old chicks, where the transport of those commodities includes transport by ship, even for part of the journey. 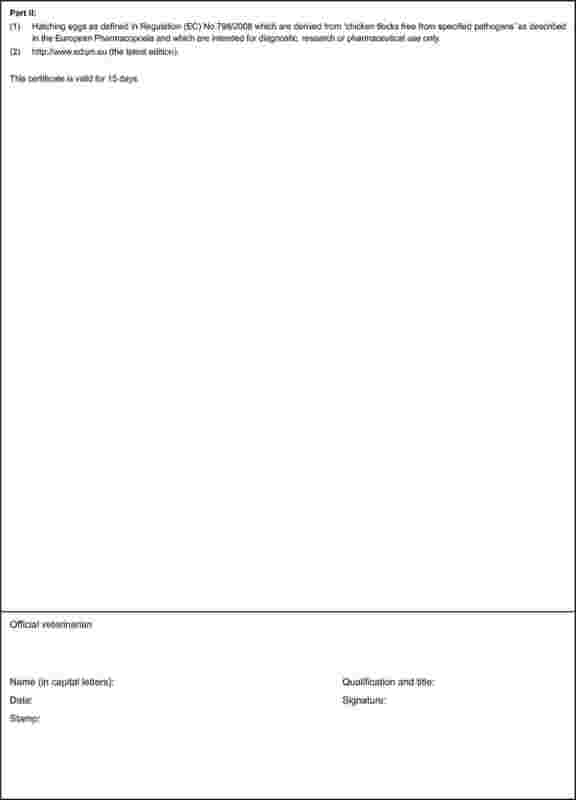 a certificate required by the third country of destination. 4. 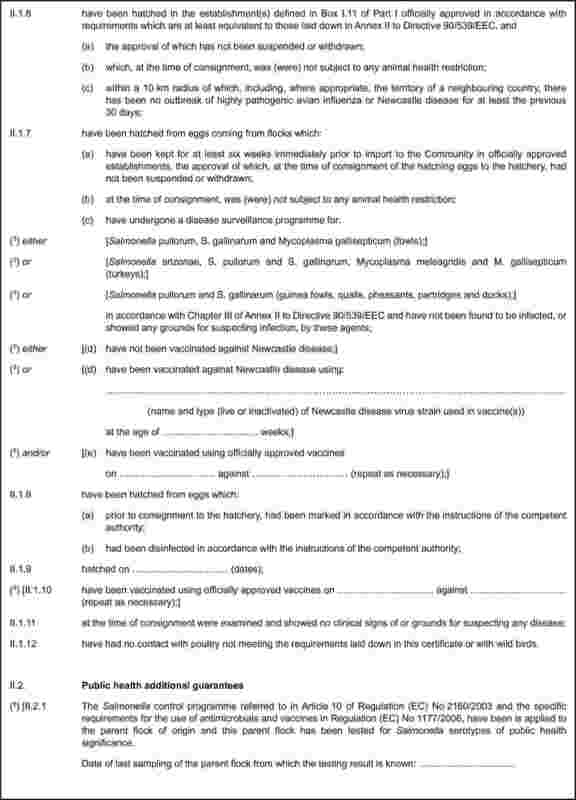 Specified pathogen-free eggs, meat, minced meat and mechanically separated meat of poultry, ratites and wild game-birds, eggs and egg products transiting through the Community shall be accompanied by a certificate drawn up in accordance with the model certificate set out in Annex XI and complying with the conditions set out therein. 5. For the purposes of this Regulation, transit may include storage during transit in accordance with Articles 12 and 13 of Directive 97/78/EC. 6. Electronic certification and other agreed systems harmonised at Community level may be used. 1. Commodities imported into and transiting through the Community shall comply with the conditions laid down in Articles 6 and 7 and in Chapter III. the importation conditions include the requirement for post-import isolation or quarantine. 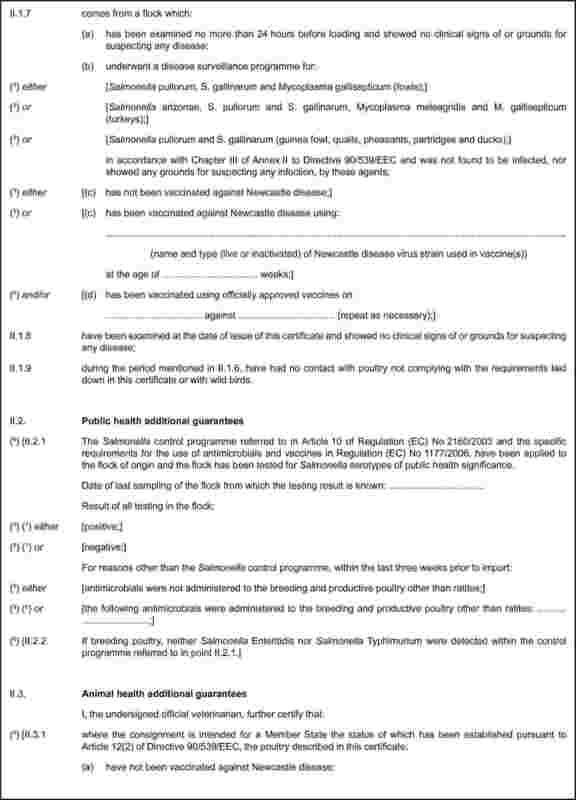 the restrictions in relation to the approval of a Salmonella control programme, shall only apply when indicated in the appropriate column of the table in Part 1 of Annex I. 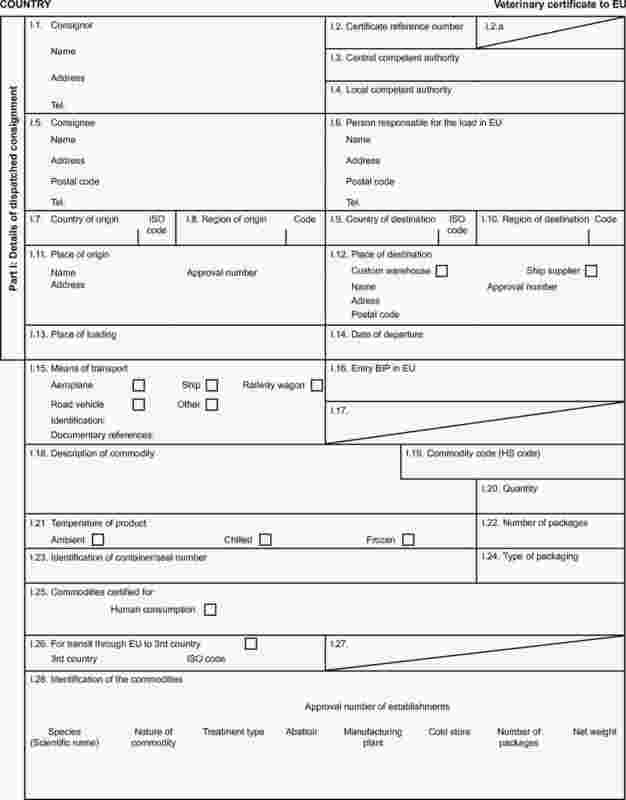 Where examination, sampling and testing for avian influenza, Mycoplasma, Newcastle disease, Salmonella, and other pathogens of animal or public health significance is required for imports of commodities into the Community in accordance with the certificates, such commodities shall only be imported into the Community where those examinations, sampling and testing have been carried out by the competent authority of the third country concerned or where appropriate by the competent authority of the Member State of destination in accordance with Annex III. 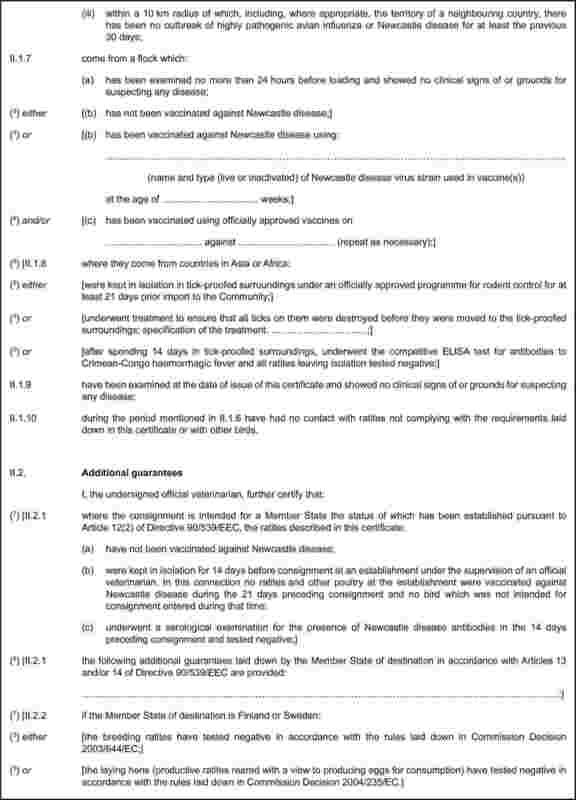 submits to the Commission regular updates on the disease situation. 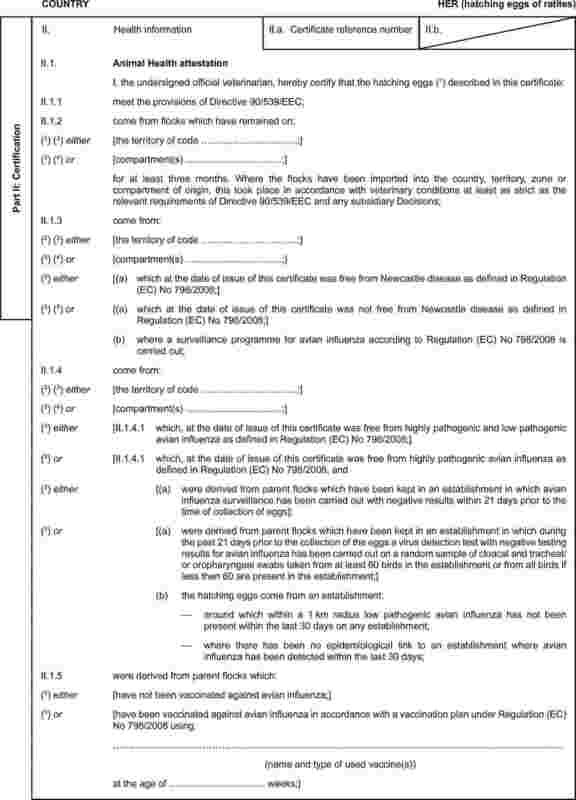 an avian influenza surveillance programme, in accordance with Article 10 has been carried out during a period of at least six months preceding the certification referred to in point (a) of this paragraph where required in the certificate. 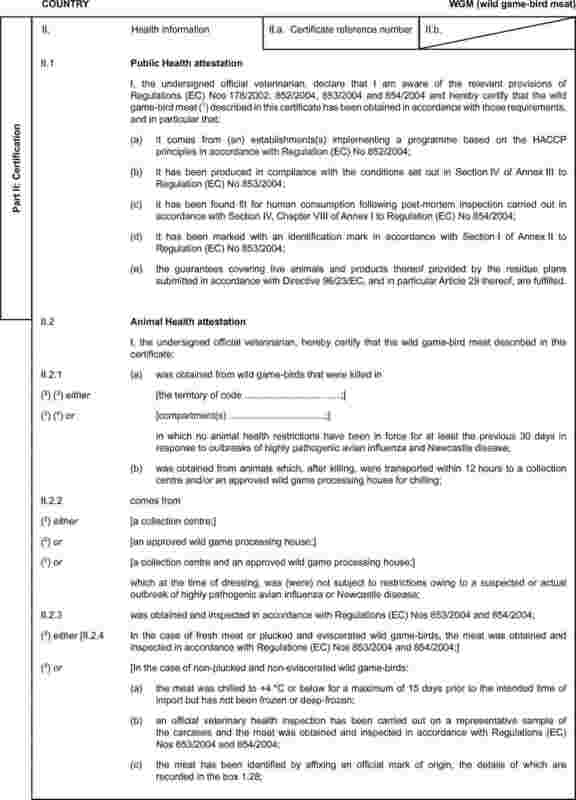 avian influenza surveillance has been carried out in accordance with Part II of Annex IV during a three-month period following completion of the cleansing and disinfection referred to in point (c) of this paragraph with negative results. 1. 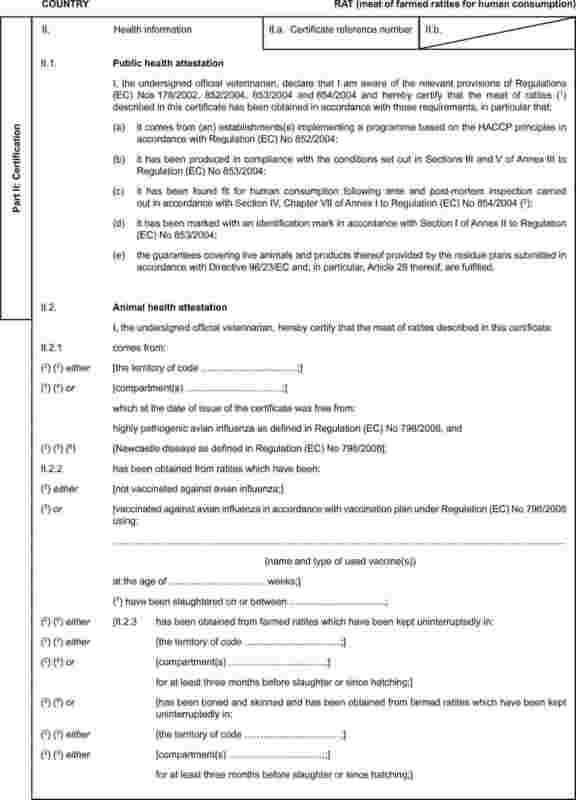 For the purposes of this Regulation, a third country, territory, zone or compartment from which commodities are imported into the Community shall be considered as free from HPAI where that disease has not been present in the third country, territory, zone or compartment for a period of at least 12 months preceding the certification by the official veterinarian. 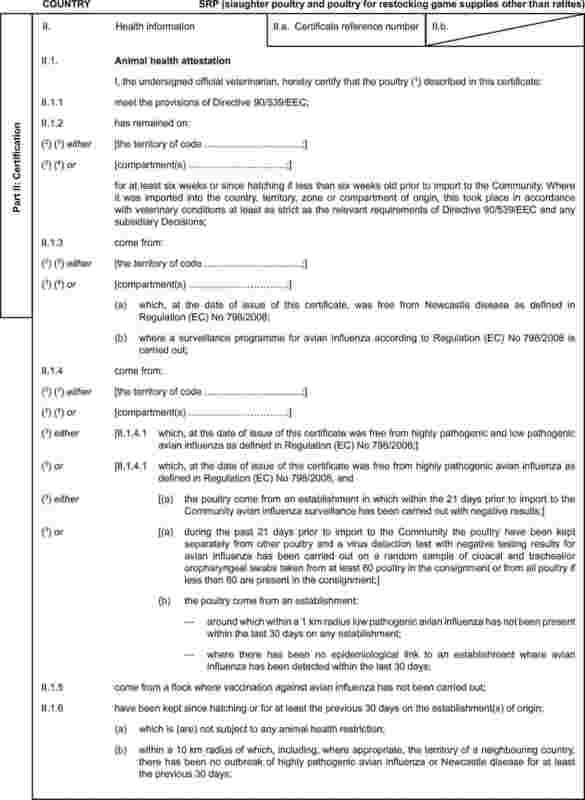 avian influenza surveillance has been carried out in accordance with Part II of Annex IV during a three-month period following completion of the stamping out policy and cleansing and disinfection referred to in point (a). the third country informs the Commission of any changes to its avian influenza surveillance programme. the third country informs the Commission of any changes to its avian influenza vaccination plan. 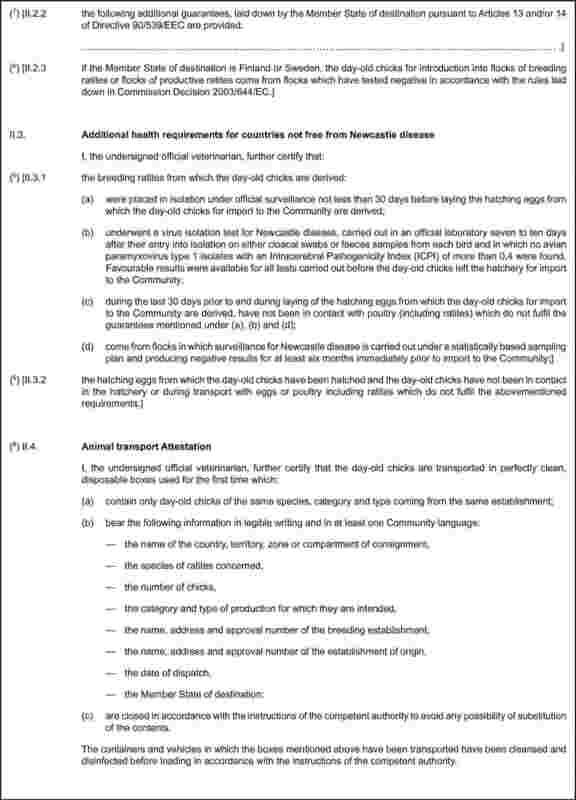 no vaccination against Newcastle disease using vaccines that do not comply with the criteria for recognised Newcastle disease vaccines set out in Annex VI has been carried out for at least the period referred to in point (a) of this paragraph. 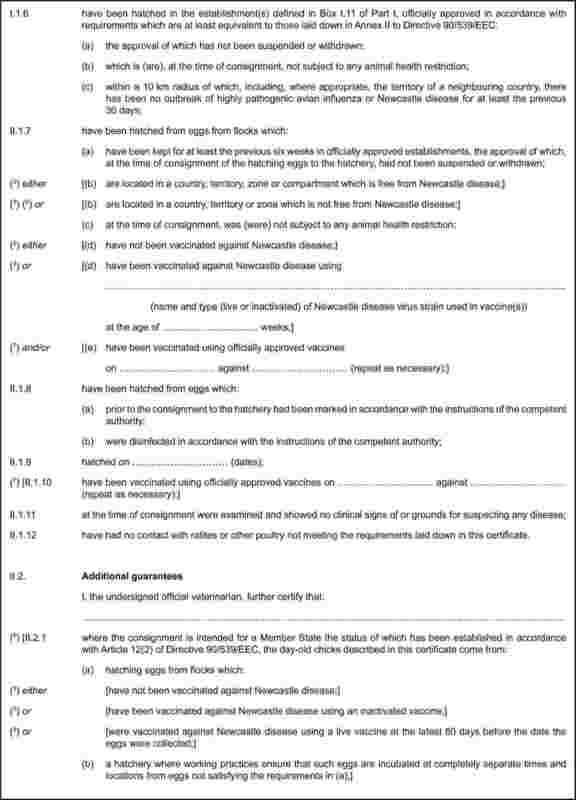 no vaccination against Newcastle disease using vaccines that do not comply with the criteria for recognised Newcastle disease vaccines set out in Annex VI has been carried out. 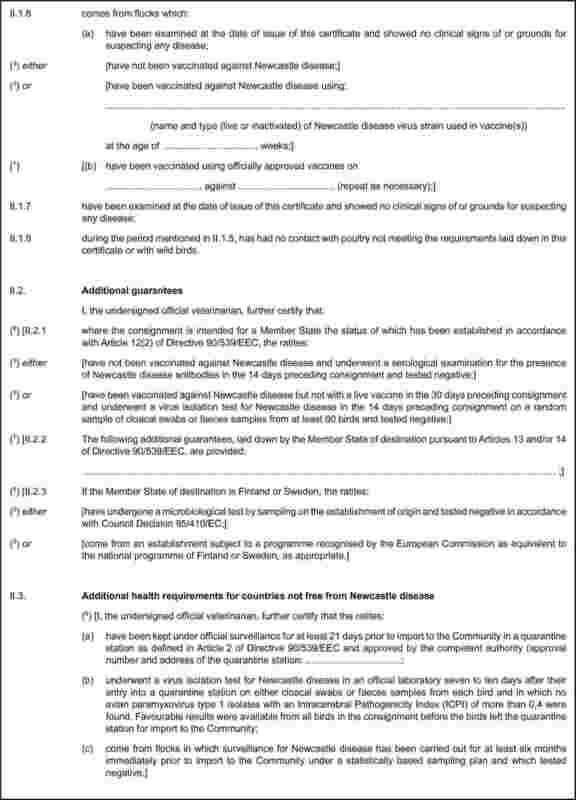 the additional health requirements set out in Part I of Annex VII are complied with. 2. 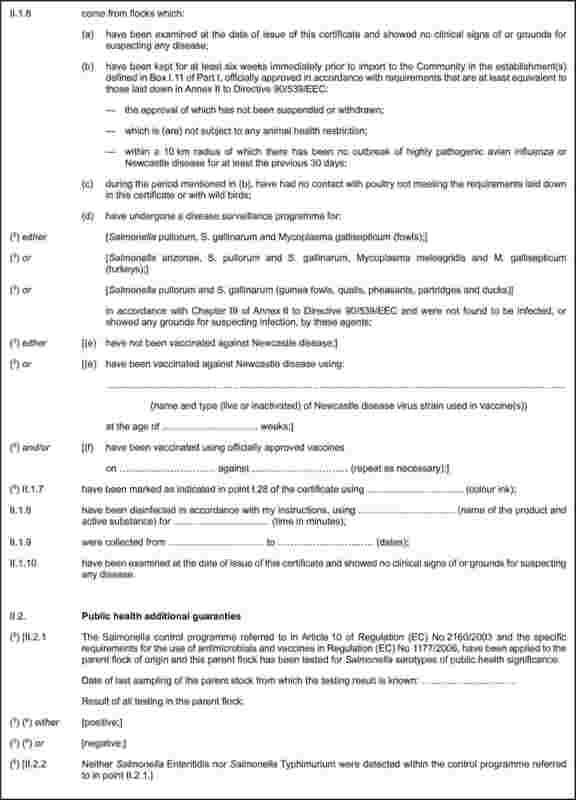 For commodities referred to in Article 1(1)(b), and by way of derogation from Article 12(1)(b) and Article 12(2)(c)(ii), a third country, territory, zone or compartment from which imports of poultrymeat into the Community are authorised, shall be considered as free from Newcastle disease where the additional health requirements laid down in Part II of Annex VII are complied with. ratites for breeding and production, hatching eggs and day-old chicks thereof, the requirements set out in Annex IX. 2. The conditions provided for in paragraph 1 shall not apply to single consignments of less than 20 units of poultry other than, ratites, hatching eggs or day-old chicks thereof. the consignor’s name or business name and address. specified pathogen-free eggs imported into the Community must be transported directly to their final destination after import controls have been completed satisfactorily. 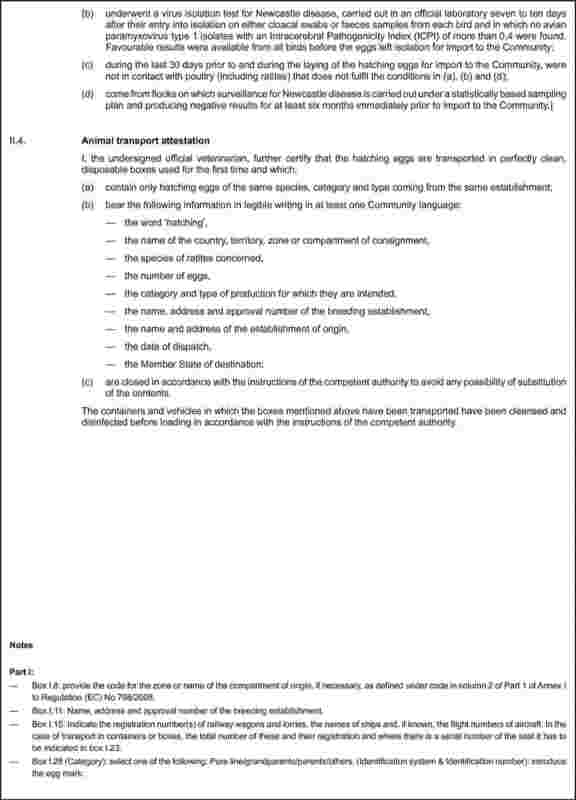 in the course of transport to the Community, shall not be moved through nor unloaded in a third country, territory, zone or compartment from which imports of such poultry and day-old chicks into the Community are not authorised. Only meat derived from ratites which have undergone the protective measures in relation to Crimean-Congo haemorrhagic fever, laid down in Part II of Annex X, may be imported into the Community. the consignment is certified as acceptable for transit on the common veterinary entry document issued by the official veterinarian at the border inspection post of entry. 2. 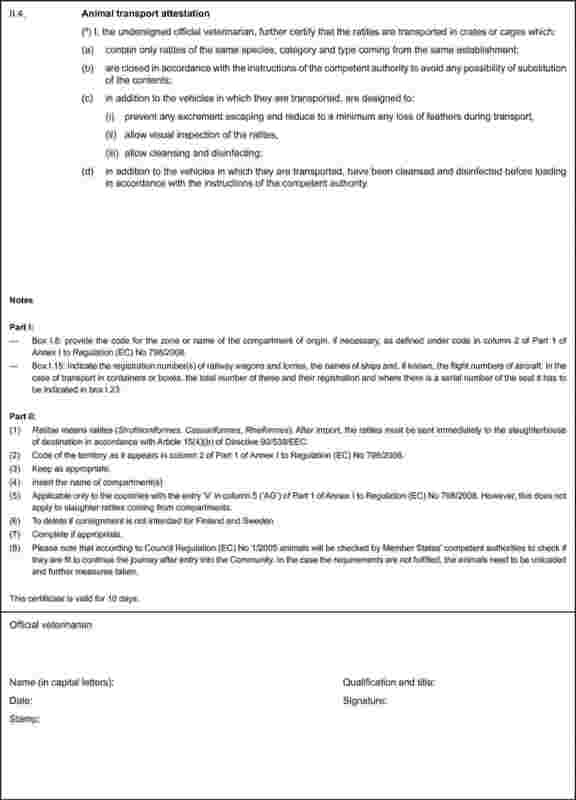 The consignments, as referred to in paragraph 1, may not be unloaded or put into storage, as referred to in Article 12(4) or in Article 13 of Directive 97/78/EC, within the Community. 3. Regular audits shall be conducted by the competent authority to ensure that the number of consignments, as referred to in paragraph 1, and the corresponding quantities of products leaving the Community correspond with the number and quantities entering the Community. Decisions 93/342/EEC, 94/438/EC and 2006/696/EC are repealed. References to the repealed Decisions shall be construed as references to this Regulation and shall be read in accordance with the correlation table in Annex XII. 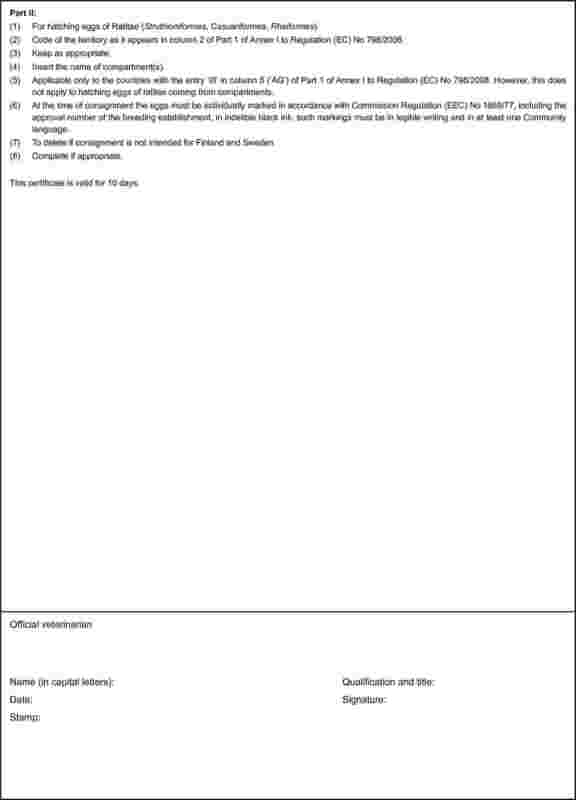 Commodities in respect of which the relevant veterinary certificates have been issued in accordance with Decisions 93/342/EEC, 94/438/EC and 2006/696/EC may be imported into or transit through the Community until 15 February 2009. 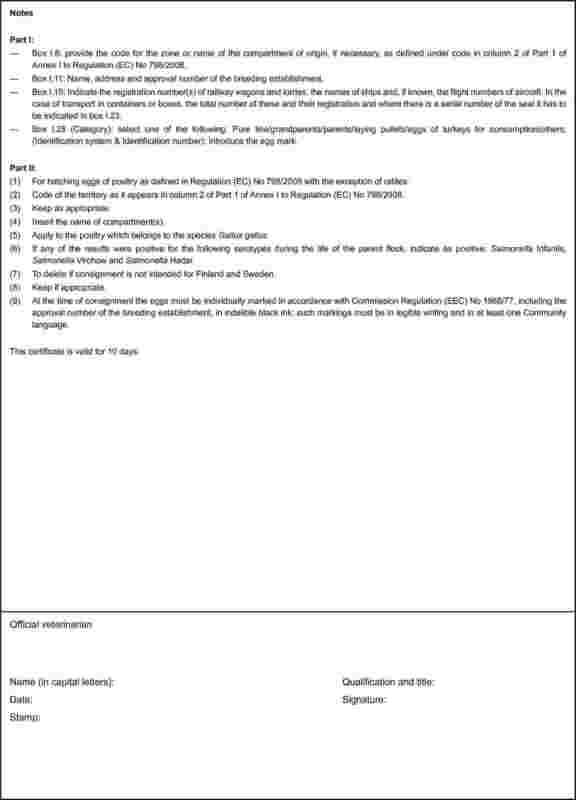 It shall apply from 1 January 2009. Done at Brussels, 8 August 2008. (1) OJ L 303, 31.10.1990, p. 6. Directive as last amended by Commission Decision 2007/729/EC (OJ L 294, 13.11.2007, p. 26). (2) OJ L 268, 24.9.1991, p. 56. Directive as last amended by Directive 2006/104/EC (OJ L 363, 20.12.2006, p. 352). (3) OJ L 125, 23.5.1996, p. 10. Directive as last amended by Directive 2006/104/EC. (4) OJ L 24, 30.1.1998, p. 9. Directive as last amended by Directive 2006/104/EC. (5) OJ L 18, 23.1.2003, p. 11. (6) OJ L 325, 12.12.2003, p. 1. Regulation as last amended by Commission Regulation (EC) No 1237/2007 (OJ L 280, 24.10.2007, p. 5). (7) OJ L 139, 30.4.2004, p. 55; corrected by OJ L 226, 25.6.2004, p. 22. Regulation as last amended by Commission Regulation (EC) No 1243/2007 (OJ L 281, 25.10.2007, p. 8). (8) OJ L 139, 30.4.2004, p. 206; corrected by OJ L 226, 25.6.2004, p. 83. 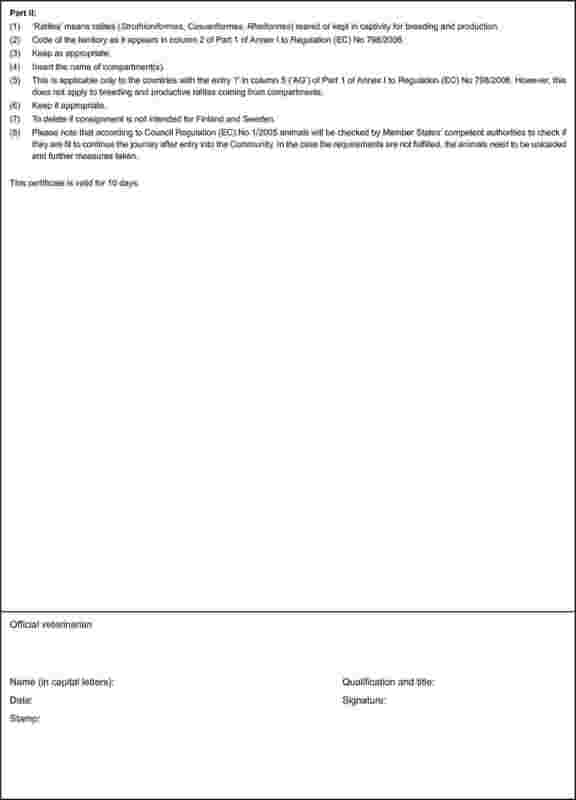 Regulation as last amended by Council Regulation (EC) No 1791/2006 OJ L 363, 20.12.2006, p. 1). (9) OJ L 295, 25.10.2006, p. 1. 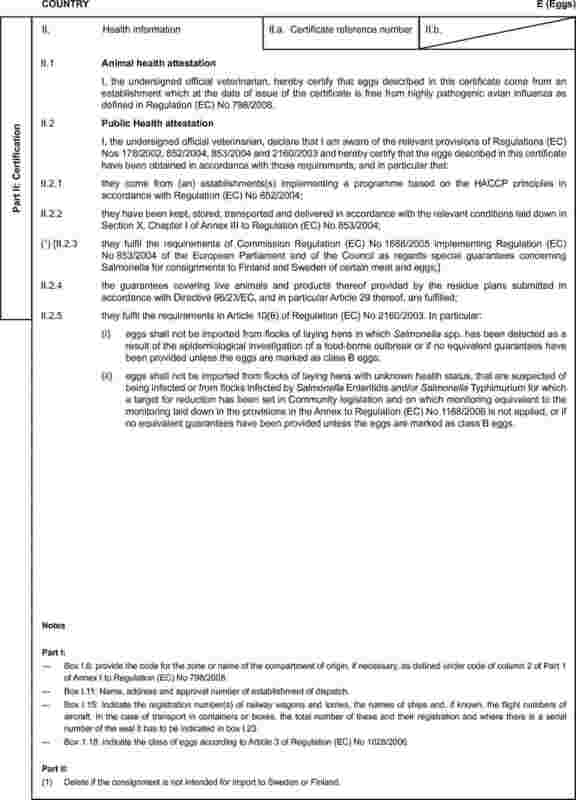 Decision as last amended by Regulation (EC) No 1237/2007. (10) OJ L 137, 8.6.1993, p. 24. Decision as last amended by Decision 2006/696/EC (OJ L 295, 25.10.2006, p. 1). (11) OJ L 181, 15.7.1994, p. 35; corrected by OJ L 187, 26.5.2004, p. 8. (12) OJ L 10, 14.1.2006, p. 16. (15) OJ L 299, 16.11.2007, p. 1. Regulation as last amended by Commission Regulation (EC) No 510/2008 (OJ L 149, 7.6.2008, p. 61). (16) OJ L 13, 16.1.1997, p. 28. (18) Veterinary Laboratories Agency, New Haw, Weybridge, Surrey KT 153NB, United Kingdom. (20) OJ L 326, 11.12.2001, p. 44. 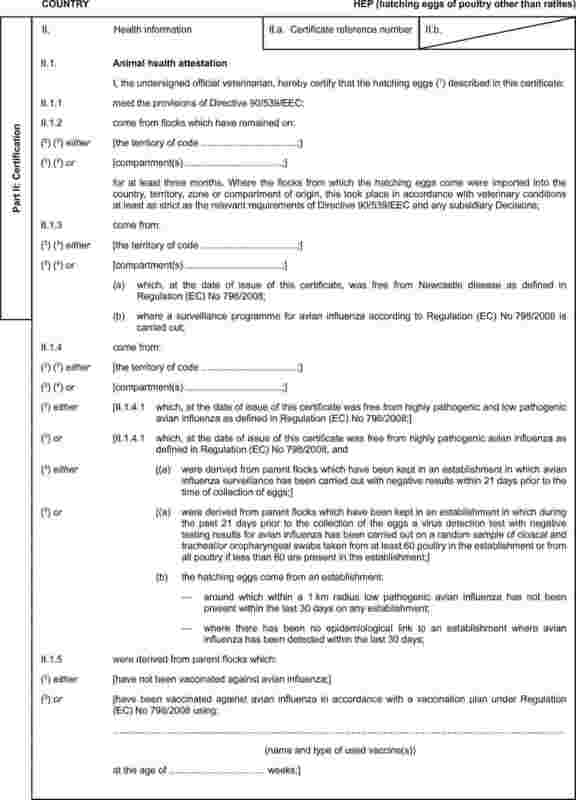 Prohibition to import into the Community breeding poultry of Gallus gallus, day-old chicks of Gallus gallus intended for breeding purposes and hatching eggs of Gallus gallus because a Salmonella control programme in accordance with Regulation (EC) No 2160/2003 has not been submitted to the Commission or approved by it. Veterinary certificates based on the models in Part 2 of this Annex and following the layout of the model that corresponds to the commodity concerned shall be issued by the exporting country, territory, zone or compartment. They shall contain, in the order appearing in the model, the attestations that are required for any third country and, where applicable, those additional health requirements required for the exporting country, territory, zone or compartment. 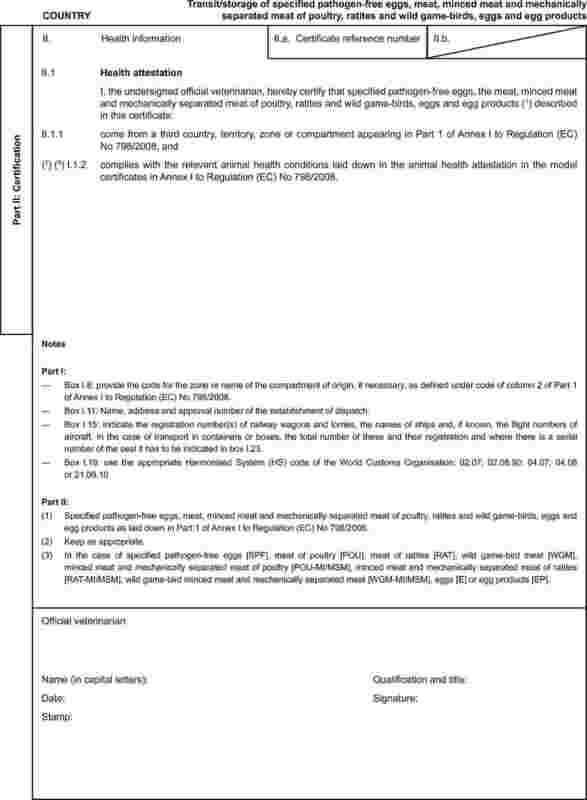 Where additional guarantees are required by the EU Member State of destination for the commodity concerned, these shall also be entered on the original of the veterinary certificate. A separate, single certificate must be presented for each consignment of the commodity concerned, exported to the same destination from a territory appearing in columns 2 and 3 of Part 1 of this Annex and transported in the same railway wagon, lorry, aircraft or ship. The original of certificates shall consist of a single page printed on both sides or, where more text is required, such that all the pages form a whole and cannot be separated. 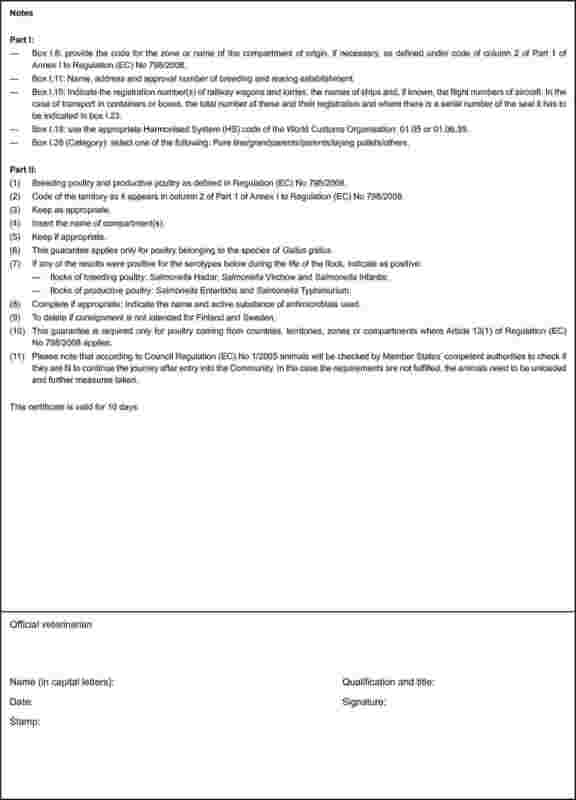 The certificate shall be drawn up in at least one official language of the EU Member State where the border inspection takes place and in one official language of the EU Member State of destination. However, those Member States may allow another Community language instead of their own, accompanied, if necessary, by an official translation. Where additional pages are attached to the certificate for the purposes of identifying the items making up the consignment, such additional pages shall also be considered to form part of the original of the certificate, provided the signature and stamp of the certifying official veterinarian appear on each page. 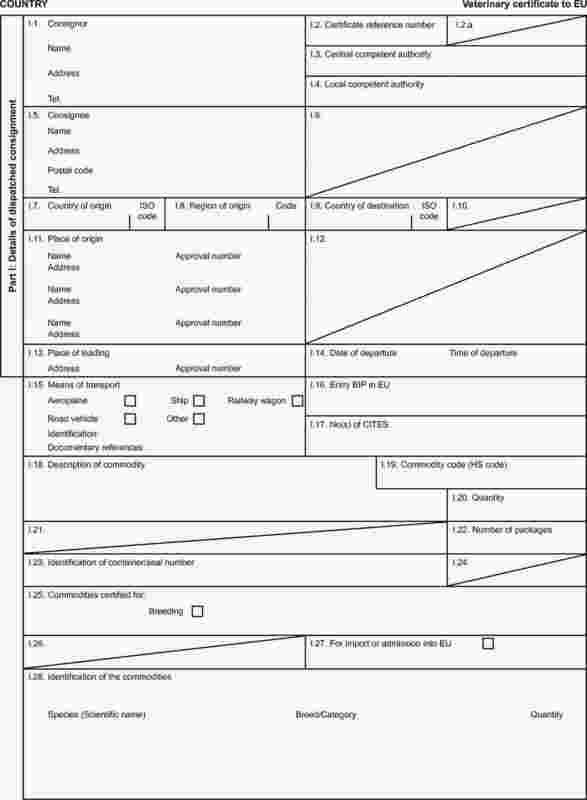 Where the certificate, including any additional pages as provided for in (e), comprises more than one page, each page shall be numbered ‘–x(page number) of y(total number of pages)–’ on the bottom and shall bear the code number of the certificate allocated by the competent authority on the top. The original of the certificate must be completed and signed by an official veterinarian not more than 24 hours prior to loading of the consignment for imports to the Community, unless otherwise stated. To that end, the competent authorities of the exporting country shall ensure that principles of certification equivalent to those laid down in Directive 96/93/EC are followed. The colour of the signature shall be different from that of the printing. The same rule shall apply to stamps other than embossed stamps or watermarks. 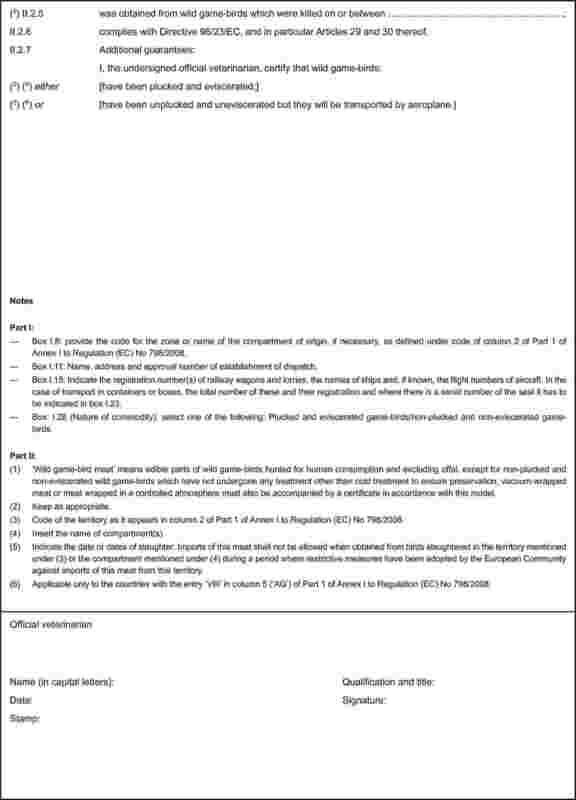 The original of the certificate must accompany the consignment as far as the EU border inspection post. 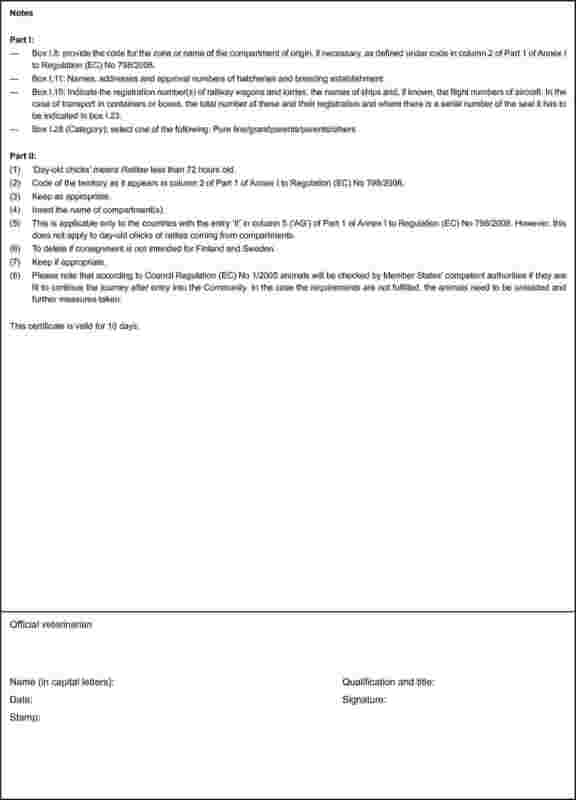 The certificate shall be valid for 10 days from the date of issue, unless otherwise stated. In the case of transport by ship, the term of validity shall be extended by the time taken by the voyage. To that end, the original of a declaration by the ship's master, drawn up in accordance with Annex II, shall be attached to the veterinary certificate. Poultry and day-old chicks shall not be transported with other poultry and day-old chicks that are either not intended for the European Community or of a lower health status. 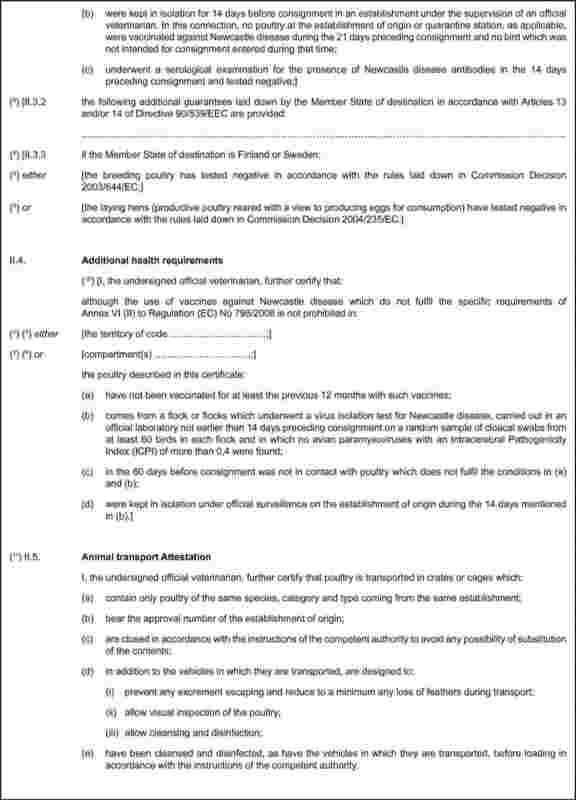 Poultry and day-old chicks shall not in the course of transport to the Community be moved through nor unloaded in a third country, territory, zone or compartment from which imports of such poultry and day-old chicks into the Community are not authorised. (1) Commodities, including those transported on the high seas, produced before this date may be imported into the Community during a period of 90 days from this date. (2) Only commodities produced after this date may be imported into the Community. 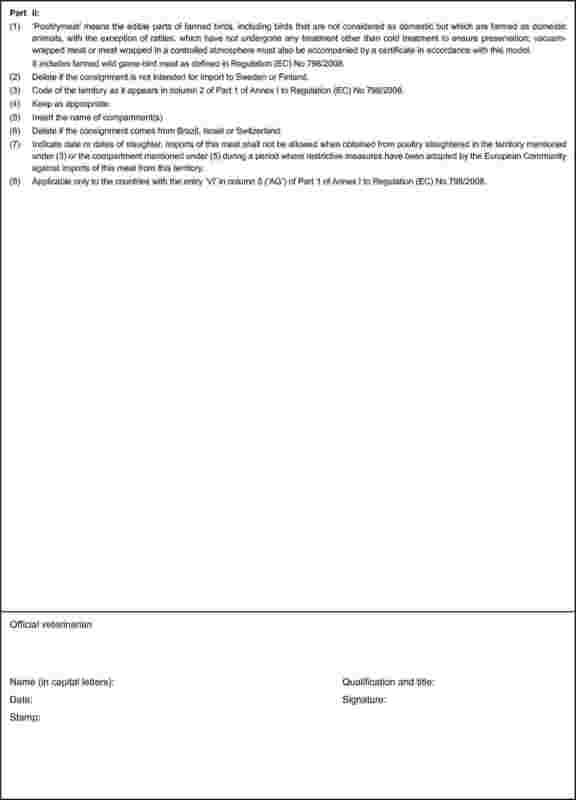 (3) Certificates in accordance with the agreement between the European Community and the Swiss Confederation on trade in agricultural products (OJ L 114, 30.4.2002, p. 132 as last amended). (4) The former Yugoslav Republic of Macedonia; provisional code that does not prejudge in any way the definitive nomenclature for this country, which will be agreed following the conclusion of negotiations currently taking place on this subject in the United Nations. (5) Not including Kosovo, as defined by United Nations Security Council Resolution 1244 of 10 June 1999. Manual of Diagnostic Tests and Vaccines for Terrestrial Animals of the World Organisation for animal Health (OIE) (2). 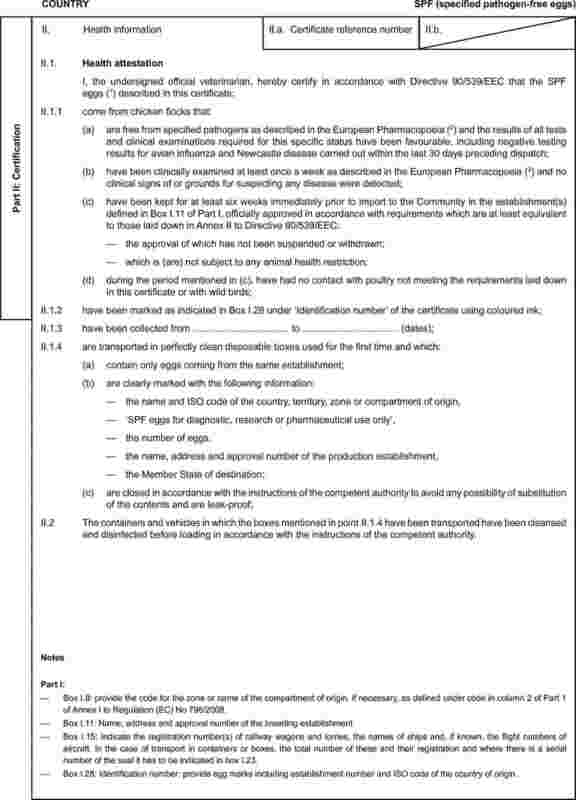 Where Article 12 of Directive 90/539/EEC applies, the sampling and testing methods must comply with the methods described in Annexes to Commission Decision 92/340/EEC (4). Manual of Diagnostic Tests and Vaccines for Terrestrial Animals of the World Organisation for animal Health (OIE). 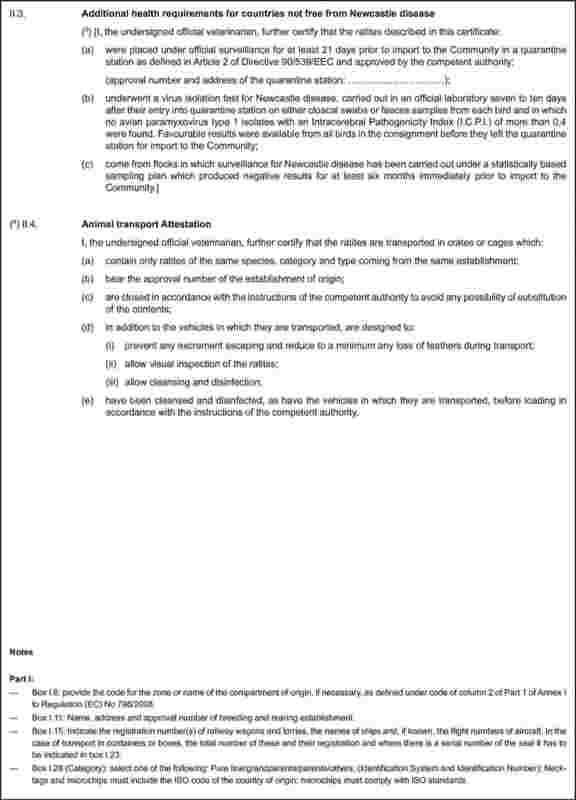 Serological examination: 60 birds must be sampled at the point of lay with methods described in the Manual of Diagnostic Tests and Vaccines for Terrestrial Animals of the World Organisation for animal Health (OIE). Chapter III of Annex II to Directive 90/539/EEC. The detection method recommended by the Community reference laboratory (CRL) for Salmonella in Bilthoven, the Netherlands, or an equivalent method shall be used. That method is described in the current version of draft Annex D of ISO 6579 (2002): ‘Detection of Salmonella spp. in animal faeces and in samples of the primary production stage’. In that detection method, a semi-solid medium (modified semi-solid Rappaport-Vassiladis medium, MSRV) is used as the single selective enrichment medium. Serotyping shall be carried out following the Kauffmann-White scheme or an equivalent method. 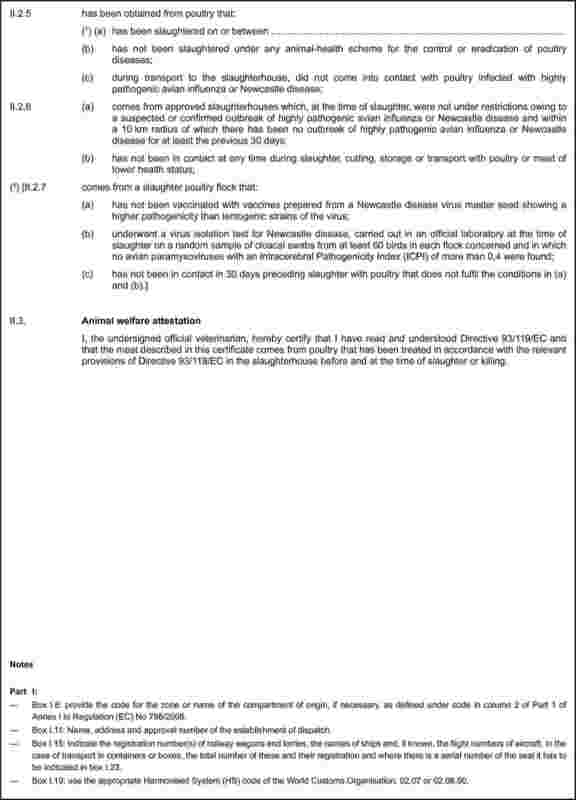 Newcastle disease as laid down in Annex III to Council Directive 92/66/EEC. Samples may be pooled, subject to a maximum of five samples from individual birds in each pool. Virus isolates must be sent without delay to the national reference laboratory. (1) OJ L 237, 31.8.2006, p. 1. (3) OJ L 260, 5.9.1992, p. 1. Directive as last amended by Directive 2006/104/EC (OJ L 363, 20.12.2006, p. 352). (4) OJ L 188, 8.7.1992, p. 34. I. 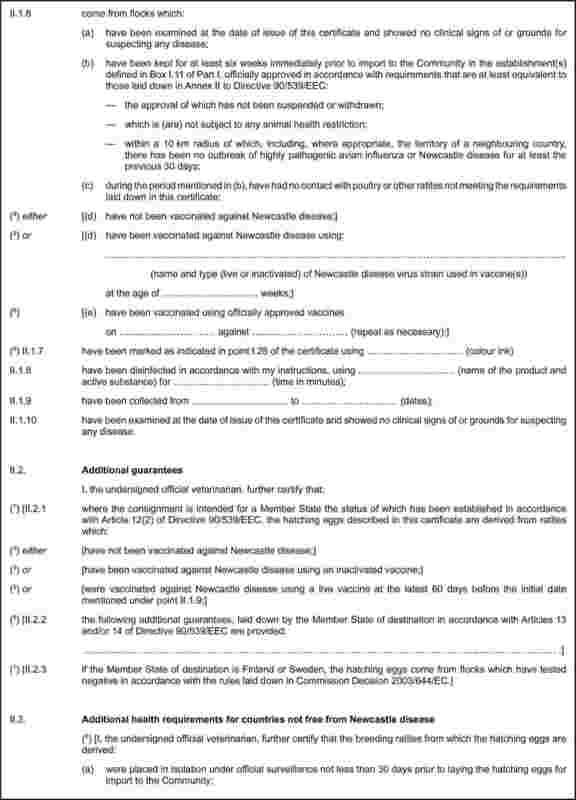 Requirements for avian influenza surveillance in poultry carried out in third countries, territories, zones or compartments as referred to in Article 10. Follow-up investigations of positive results for subtypes H5 and H7. Information referred to in point 6 and points 8 to 12 of Part I.A. Surveillance for avian influenza must provide at least the confidence by a randomised representative sample of the populations at risk to demonstrate the absence of infection taking into account the specific epidemiological circumstances in relation to the occurred outbreak(s). (1) Please give as much detailed information as necessary to allow proper assessment of the programme. Means of record keeping (e.g. 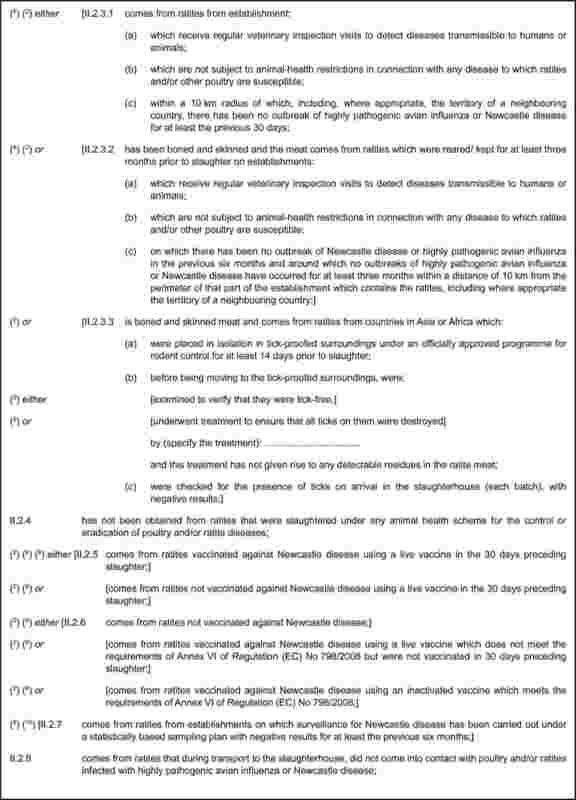 for the detailed information referred to point 15) and registration of holdings where vaccination is carried out. Vaccines must be registered by the competent authorities of the third country concerned before being allowed to be distributed and used. 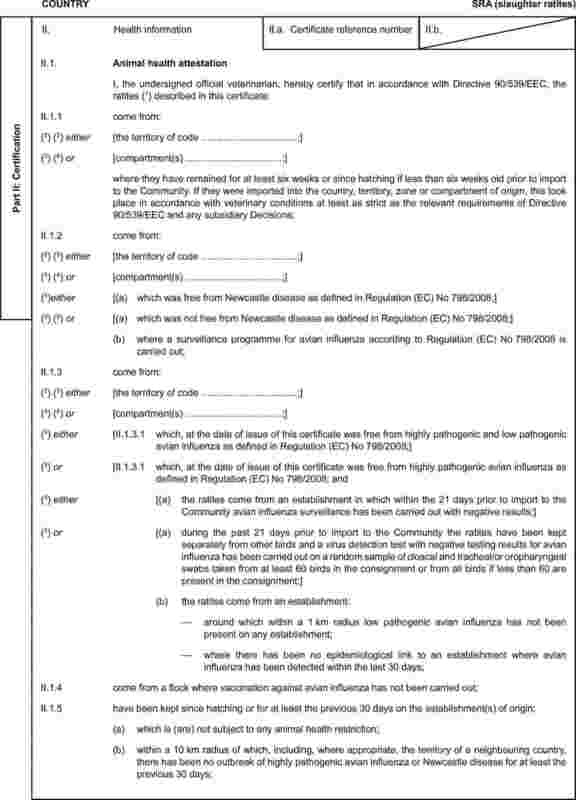 For such registration, the competent authorities must rely on a complete file containing data about efficacy and innocuity; for imported vaccines the competent authorities may rely on data checked by the competent authorities of the country where the vaccine is produced, as far as these checks have been carried out in conformity with internationally accepted standards. In addition, imports or production and distribution of the vaccines must be controlled by the competent authorities of the third country concerned. 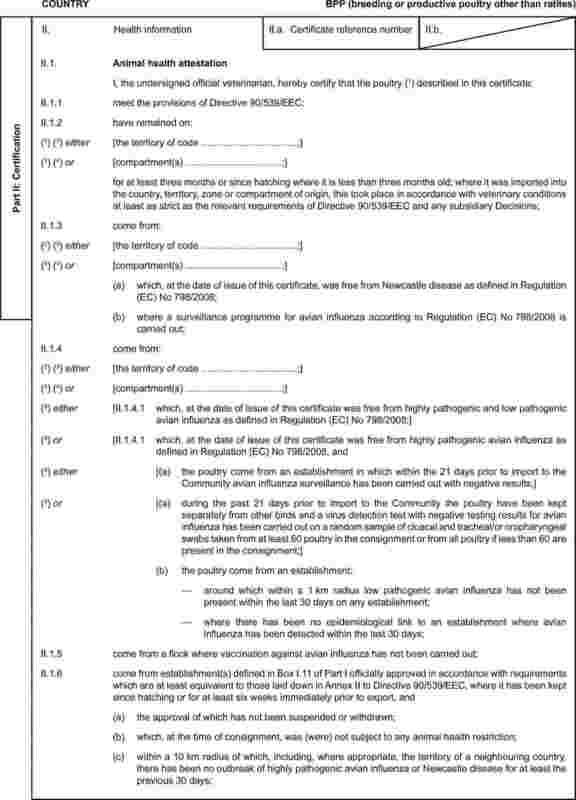 Before distribution is allowed, each batch of vaccines must be tested on innocuity, in particular regarding attenuation or inactivation and absence of undesired contaminating agents, and on efficacy on behalf of the competent authorities. less than 0,5, if not less than 108 EID50 are administered to each bird in the ICPI test. Inactivated Newcastle disease vaccines shall be prepared from a Newcastle disease virus strain with an intracerebral pathogenicity index (ICPI) in one-day-old chicks of less than 0,7, if not less than 108 EID50 are administered to each bird in the ICPI test. in which no avian paramyxoviruses with an Intracerebral Pathogenicity Index of more than 0,4 have been found. poultry must not have been in contact with poultry not meeting the requirements set out in (a) and (b) during a period of 60 days before the date of import into the Community or, in the case of hatching eggs, during a period of 60 days before the date of collection of the eggs. Where day-old chicks are imported from a third country, territory, zone or compartment as referred to in point 1, the day-old chicks and the hatching eggs from which the day-old chicks are derived must not have been in contact in the hatchery or during transport with poultry or hatching eggs not meeting the requirements set out in point 1(a) to (d). has not been in contact in 30 days preceding the date of slaughter with poultry that does not fulfil the conditions set out in (a) and (b). Breeding and productive poultry other than ratites, hatching eggs and day-old chicks other than of ratites for import into the Community shall only come from establishments which have been approved by the competent authority of the third country concerned in accordance with conditions that are at least as strict as those laid down in Annex II to Directive 90/539/EEC and where such approval has not been suspended or withdrawn. Where breeding and productive poultry other than ratites, hatching eggs and day-old chicks other than of ratites and/or their flocks of origin are to undergo testing to meet the requirements of the relevant veterinary certificates laid down in this Regulation, sampling for testing and the testing itself must be carried out in accordance with Annex III. Hatching eggs for import into the Community shall bear the name of the third country of origin and the word ‘hatching’ that is more than 3mm high in one of the official languages of the Community. the consignor's name or business name and address. where the birds are slaughtered before the expiry of the period referred to in (a), until the day of slaughter. However, the period provided for in (a) may be reduced to three weeks, provided that sampling and testing in accordance with Annex III have been carried out with favourable results. Breeding and productive poultry other than ratites which have been hatched from imported hatching eggs shall be kept for at least three weeks from the date of hatching in the hatchery or for at least three weeks on the establishment(s) to which the poultry has been sent after hatching. 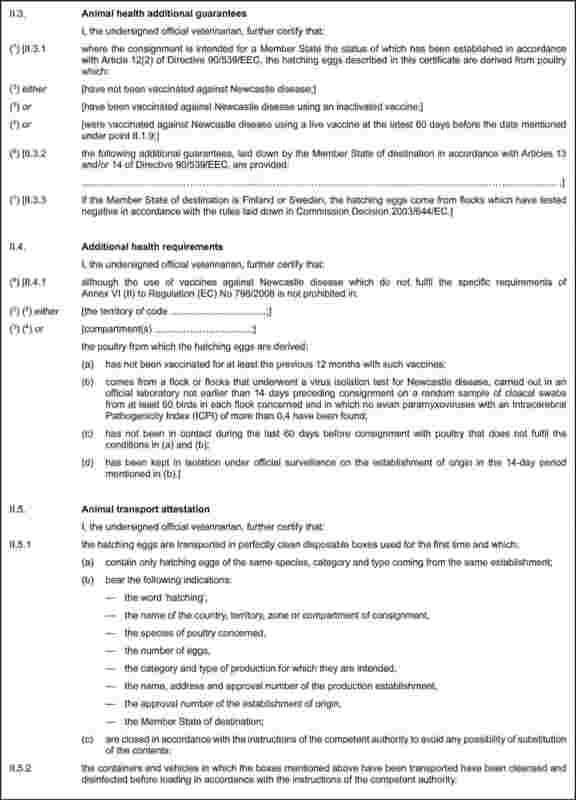 Where day-old chicks are not reared in the Member State which imported the hatching eggs, they shall be transported directly to the final destination (as specified in points 1.10 and 1.11 of the health certificate, Model 2 in Annex IV to Directive 90/539/EEC) and kept there for at least three weeks from the date of hatching. During the relevant periods, as referred to in points 1 and 2, imported breeding and productive poultry and day-old chicks and breeding and productive poultry other than ratites which have hatched from imported hatching eggs shall be kept in isolation in poultry houses where no other flocks are present. However, they may be introduced into poultry houses where breeding and productive poultry and day-old chicks are already present. In that case, the relevant periods referred to in points 1 and 2 shall commence from the date of introduction of the last imported bird and no poultry present shall be moved from the poultry houses before the end of those periods. Imported hatching eggs shall be hatched in separate incubators and hatchers. However, imported hatching eggs may be introduced into incubators and hatchers where other hatching eggs are already present. In that case, the periods referred to in points 1 and 2 shall commence from the date of introduction of the last imported hatching egg. No later than the date of expiry of the relevant periods as provided for in point 1 or 2, imported breeding and productive poultry and day-old chicks shall undergo a clinical examination carried out by the official veterinarian and, where necessary, samples shall be taken to monitor their state of health. Imported ratites for breeding and production (ratites) shall be identified by neck-tags and/or microchips bearing the ISO code of the third country of origin. Such microchips must comply with ISO standards. Imported hatching eggs of ratites shall be marked with a stamp indicating the ISO code of the third country of origin and the approval number of the establishment of origin. After the import controls have been carried out in accordance with Directive 91/496/EEC, consignments of ratites and hatching eggs and day-old chicks thereof shall be transported directly to the final destination. Ratites which have hatched from imported hatching eggs shall be kept for a period of at least three weeks from the date of hatching in the hatchery or for at least three weeks on the establishment(s) to which they have been sent after hatching. During the relevant periods as referred to in points 2 and 3, imported ratites and ratites which have hatched from imported hatching eggs shall be kept in isolation in poultry houses where no other ratites or poultry are present. However, they may be introduced into poultry houses where other ratites or poultry are already present. In that case, the periods referred to in points 2 and 3 shall commence from the date of introduction of the last imported ratite and no ratites or poultry present shall be moved from the poultry housing before the end of those periods. However, imported hatching eggs may be introduced into incubators and hatchers where other hatching eggs are already present. 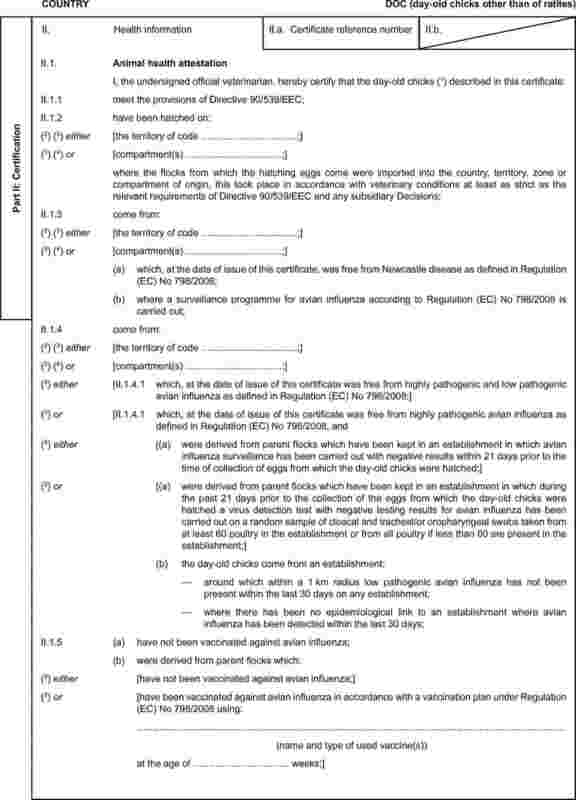 In that case, the periods referred to in points 2 and 3 shall commence from the date of introduction of the last imported hatching egg and the measures as provided for in those points shall apply. No later than the date of expiry of the relevant periods as referred to in point 2 or 3, imported ratites and day-old chicks thereof shall undergo a clinical examination carried out by an official veterinarian and, where necessary, samples shall be taken to monitor their state of health. The protective measures for Crimean-Congo haemorrhagic fever set out in Part I of Annex X shall apply to ratites for breeding and production and day-old chicks thereof coming from third countries, territories, zones or compartments in Asia and Africa. All ratites testing positive to the competitive ELISA test for antibodies to Crimean Congo haemorrhagic fever provided for therein shall be destroyed. All birds of the same consignment shall be retested by the competitive ELISA test 21 days after the date of the original sampling. Where any bird tests positive all birds in the same consignment shall be destroyed. negative results of the tests provided for in points (b) and (c) shall be available before any bird is released from isolation. The competent authority shall ensure that the ratites are isolated in rodent-proof, tick-free surroundings for at least 21 days prior to the date of import into the Community. Before moving to the tick-free surroundings, the ratites shall be treated to ensure that all ectoparasites on them are destroyed. After 14 days in tick-free surroundings, the ratites shall undergo the competitive ELISA test for antibodies to Crimean-Congo haemorrhagic fever. Every animal put into isolation must test negative to the test. On the ratites' arrival in the Community, the treatment for ectoparasites and the serological test shall be repeated. The competent authority shall ensure that the ratites are isolated in rodent-proof, tick-free surroundings for at least 14 days prior to the date of slaughter. Before moving to the tick-free surroundings, the ratites shall either be examined to verify that they are tick-free or treated to ensure that all ticks on them are destroyed. The treatment used must be specified on the import certificate. Any treatment used shall not result in any detectable residues in the ratite meat. Each batch of ratites shall be examined for ticks prior to slaughter. If any ticks are detected, the entire batch shall again be put into pre-slaughter isolation.